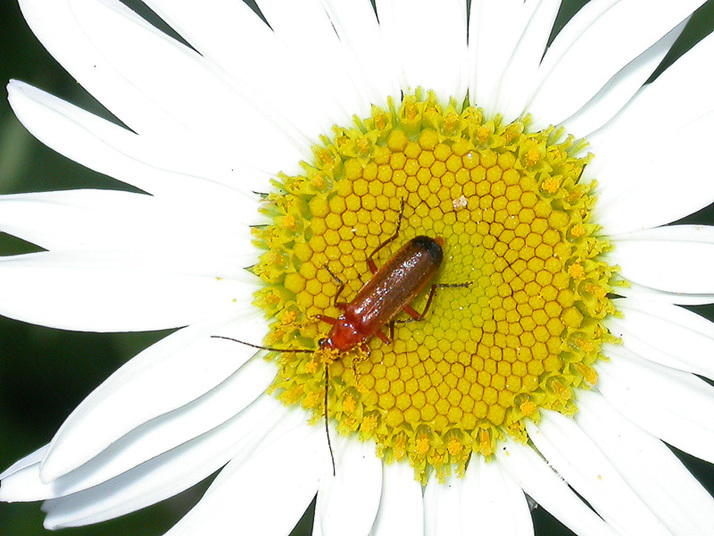 As I was out looking at the garden I noticed that these little red bugs were on all of the Shasta Daisys. I do not know their name, but I do know that they love the pollen from the flowers. Look here, Elizabeth. That's their name, Rhagonycha fulva. I believe in English thei're called Soldier beetle. (There's also a saylor beetle, I believe). I like the pollen on its body. Nice sharpness, good compo, but I think there's a bit too much reflection from the flash. Excellent close-up of the bug and daisy. We can clearly see that the bugs face and front legs are covered in pollen. The petals are a bit overexposed though. Nice close up of bug on the flower. Composition is good as well as the colour. I agree with lacouette the petals are a bit overexposed. Good shot. You do not put the flower in the center, I like it. A little bit too much light on the petals maybe. Thanks for sharing.